Hot Fudge w/Nuts 1x12 - 20W (6V6s) or 35W (6L6s or EL34s). Hot Fudge w/Nuts 1x12 - GZ34, (2)-6V6, 6L6 or EL34, (3)-12AX7. AB push-pull with adjustable fixed bias. Single TONE control plus DEEP switch. Power tube bias modulation type vibrato (no opticoupler) with all tube circuitry. Full-size (15/16") chassis-mount with 3/8" bushing, solid metal shaft, damped action. Hand-wired point-to-point with tinned solid-core PVC wiring, G-10 glass epoxy circuit board with brass eyelets. Carbon film resistors, Mallory M150 and CDM silver mica tone capacitors, Switchcraft jacks, Carling switches, and U.S. made molded type sockets. Hot Fudge 1x10 uses the Allen TP25, TO25 transformer set and TC choke. 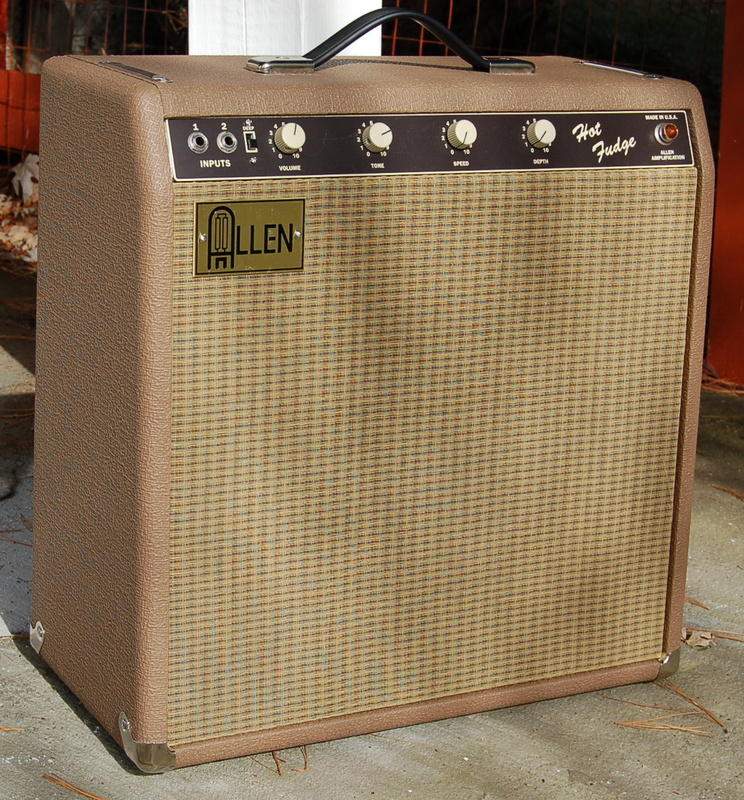 Hot Fudge w/Nuts 1x12 uses the Allen TP25 and TO35 transformer set and TC choke. See the TRANSFORMERS page for details. 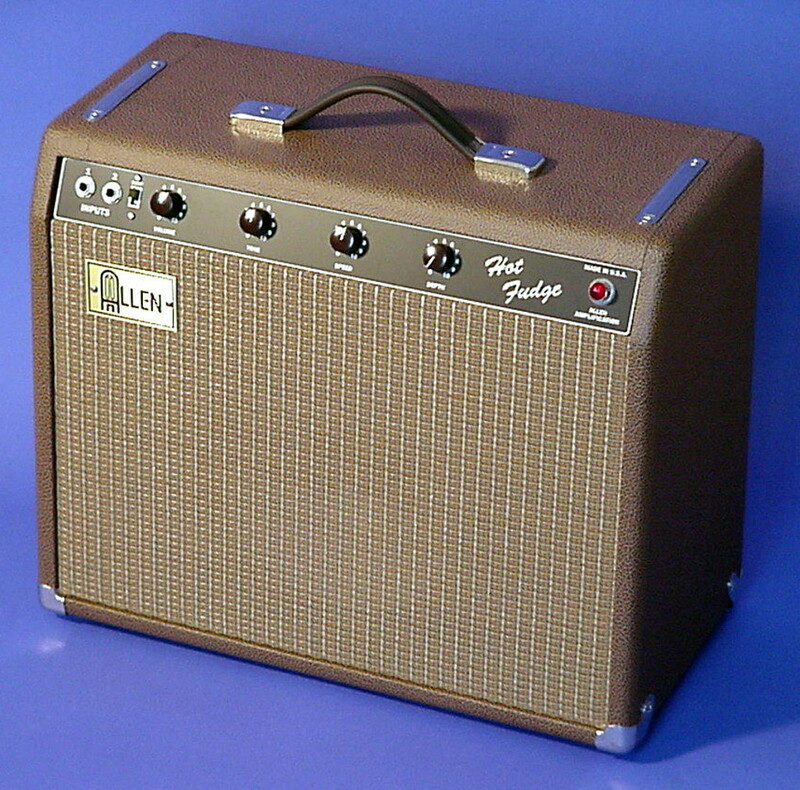 Hot Fudge 1x10 is 6G2 (brown Princeton) inspired but enhanced with DEEP switch, adjustable fixed bias with measurement jacks and bigger transformers. Hot Fudge w/Nuts 1x12 is 6G3 (brown Deluxe) inspired (long tailed pair phase inverter) but with 6G11 (brown Vibrolux) vibrato plus all of the above mentioned enhancements. 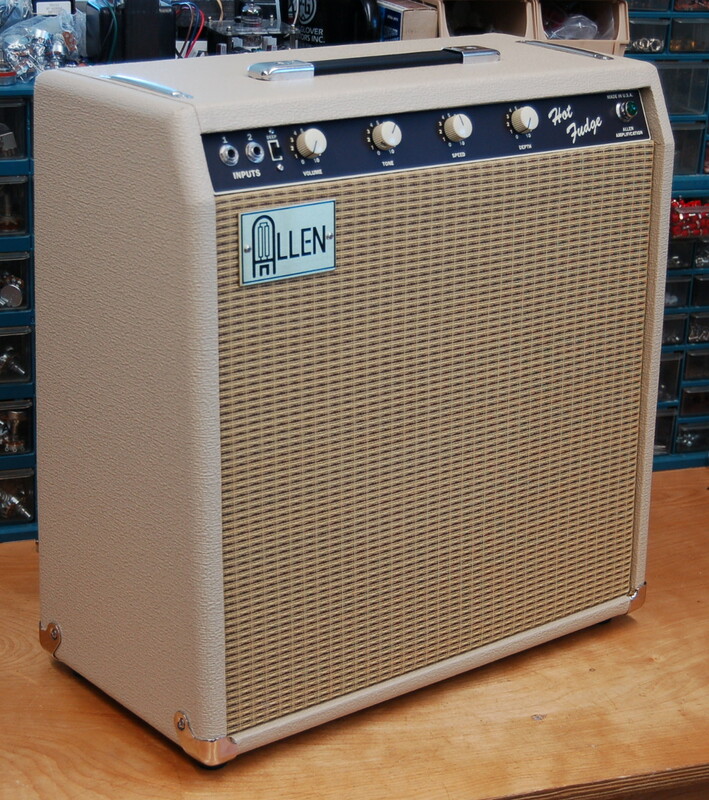 Finger-jointed pine with British Cocoa Tolex and Custom Brown grill cloth. Rear screw-on back panels, rubber feet, steel reinforced rubber strap handle with chrome caps and bottom chrome corners. Brushed brass logo and black or cream barrel knobs. Hot Fudge 1x10 - Eminence Copperhead 10". Hot Fudge w/Nuts 1x12 - Eminence Red, White and Blues 1x12. Deep switch adds a 50uf cathode bypass capacitor in parallel with the .68uf capacitor for the first gain stage. 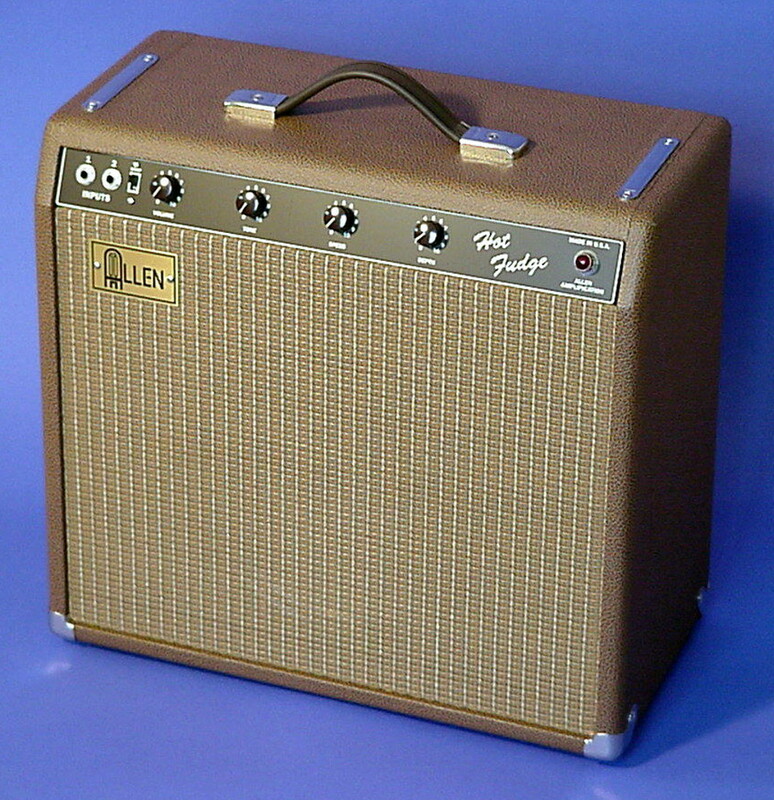 The 50uf cap is more Fenderish while the .68uf is more Marshall like. Rear bias measurement jacks plus adjustment pot for easy biasing with a voltmeter. Extension speaker jack. Choke filtered power supply. Aluminum chassis is non magnetic for quieter operation and will never rust. Black, 12-foot, 3-prong grounded heavy-duty 18/3 with strain relief bushing. Rear mounted POWER and STANDBY toggle switches. Front panel pilot-light for AC power with choice of red, green, blue, amber, or purple jeweled lens and #47 bulb. 1x10 Combo - 20"W x 16"H x 9-3/4"D, 31 lbs. 1x12 Combo - 20"W x 20"H x 9-3/4"D, 35 lbs. Head - 20"W x 10"H x 9-1/2"D, 22 lbs. Now available in kit form! 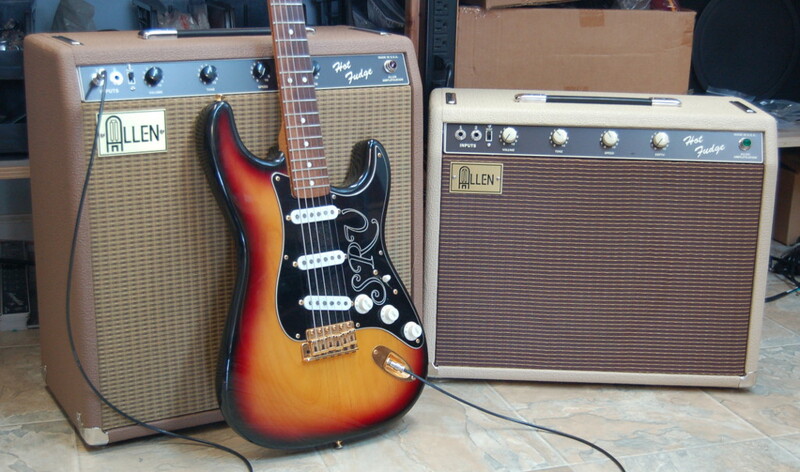 See the Amp Kits page. Matching speaker cabinets available too! See the Cabinets page. Hot Fudge with Nuts, 1x12, 6V6s, and a Red, White, and Blues speaker. A Route 66 overdrive pedal was used on a few of the heavier clips as noted. 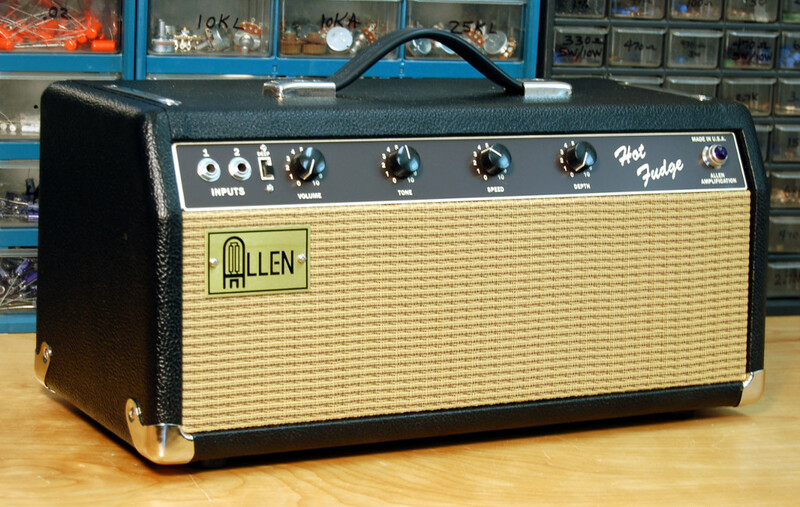 Tony Sims checks out the Allen Hot Fudge amp.